The second season of the gay-themed comedy-drama Junjo Romantica comes to Blu-ray this week. If you need a catch-up, then check our previous article introducing the characters and explaining the significance of this “Boys’ Love” series, which was one of the first TV anime to centre on homosexual relationships. Even now, Boys’ Love is hardly a common genre in TV anime, though this year’s high-profile Banana Fish, a crime anime with gay heroes that’s now running on the Noitamina block, suggests anime studios may be less wary of the subject than they once were. Then again, it also illustrates how conservative TV anime is compared to manga. Banana Fish is based on an acclaimed manga serial that was written thirty years ago. Junjo Romantica’s second season is a long way from the gangster mayhem of Banana Fish. This is a fundamentally gentle, feel-good show, with no physical violence or threat, largely a series of comic arguments and misunderstandings to mar its characters’ path to happiness. Many of the stories have characters fretting over whether they’re right for their partners, while at the same time being determined to do the best for them, whatever the sacrifice. One change from the show’s first season is that someone has clearly decided that the “lead” male couple, consisting of the great author Akihiko and the bewildered college boy Misaki, are far bigger audience draws than any of the other characters. In the first season, Akihiko and Misaki were in half the episodes, though a younger Akihiko figured in a different storyline, too. 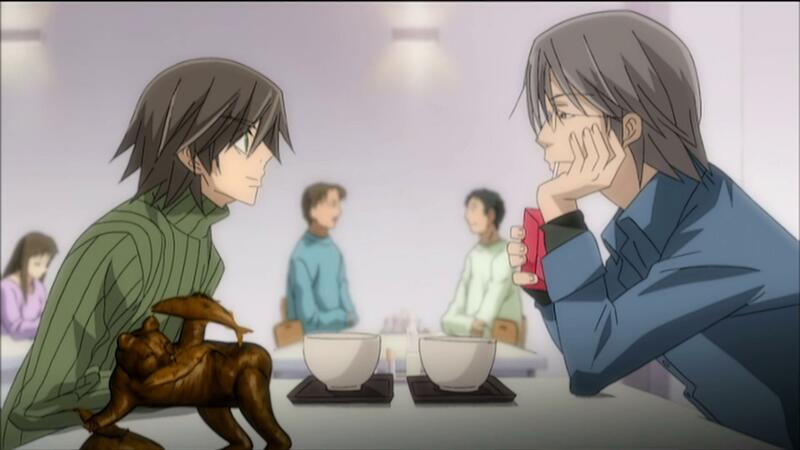 In the second season, Akihiko and Misakai’s continuing journey runs through nine of the twelve episodes, relegating the other couples – Nowaki and Hiro, Miyagi and Shinobu – to guest appearances here and there. Luckily, Akihiko and Misaki’s story develops interestingly, with more drama amid the comedy. Without giving too much away, the arc plot involves Misaki meeting several new male characters who reveal more about the enigmatic author whose life he now shares. Some of these newcomers make it clear that they’re romantically interested in him, and they’re not put off by Misaski’s stammering but heartfelt loyalty to Akihiko. At the same time, Misaki finds – believably enough – that some people in Akihiko’s circle don’t approve of their relationship. As the series presents it, this is less because of homophobia than because the doubters are worried that a manga-loving youth isn’t the best of matches for a great literary author. Anime isn’t usually full of class issues, but we see Misaki truly intimidated as he sees more and more of the high society that Akihiko inhabits; this is less Crazy Rich Asians and more Brideshead Revisited, with huge British-style mansions plonked in central Tokyo, butlers and maids included. Misaki is also warned that his relationship with Akihiko might cause a public scandal, which seems rather less convincing. After all, Akihiko is famous for being an author, not a movie star or rock god trapped by hetero expectations. How many of the literature lovers who flock to Akiko’s public appearances wouldn’t know that a swathe of legendary writers through history were gay, or at least had intense gay relationships, including Britain’s Evelyn Waugh – whose Brideshead iconography shapes the British-raised Akihiko – and Japan’s own vaunted Yukio Mishima? Junjo Romantica season two is available in the UK from Anime Limited.